The transmission NRF experimental verification system used by LNSP. 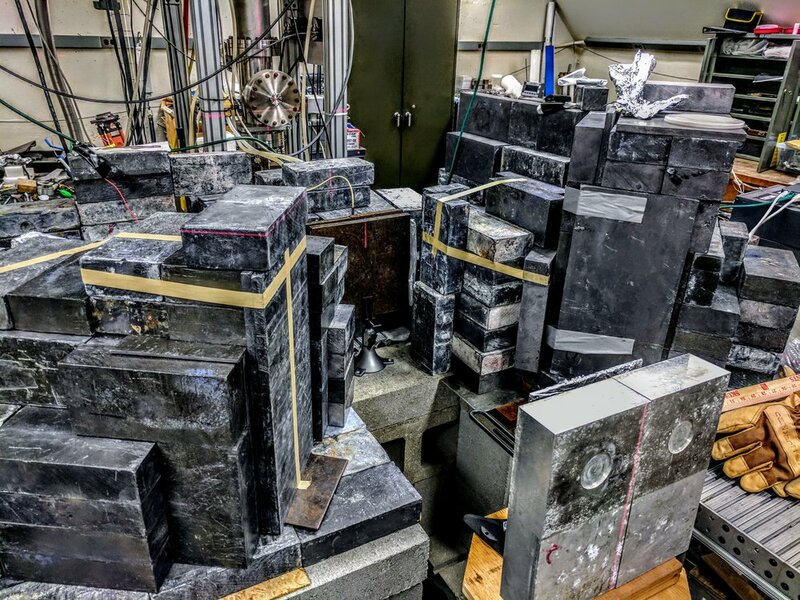 The combination of low cross sections of NRF and the slowness of the germanium detectors require us to use (multiple) tons of lead shielding to make a measurement happen. Most people are familiar with the reddish glow of a neon sign, the orange of a sodium street lamp, or violet of a mercury black light. The colors of these lights are signatures of the elements emitting the light, each color unique to each element and determined by the energies of the electrons around that element's nucleus. In an analogous way, the protons and neutrons inside the nucleus are associated with another set of energies, and these too can glow with a unique set of colors, except instead of visible light it takes photons of much higher energies -- a million times higher! -- to get those nuclei to glow. By observing the spectrum of these x-rays, we can determine not only the elements, but also isotopes from which an object is made. This is called Nuclear Resonance Fluorescence (NRF), and it lets us determine the exact composition of the nuclear warhead. Unlike other non-resonant nuclear measurements, it is impossible to substitute one isotope or element for another without getting caught. Not only do we need to check all the materials used to make the warhead, it's also necessary to determine that the warhead has all those materials in all the correct locations. By measuring the NRF signature of the test object from many different angles, we in effect create a tomographic map of the distribution of isotopes within the object. The challenge of warhead verification comes in protecting secret information. A straightforward measurement of the warhead's composition and geometry would reveal far too much information to the inspector. Rather than relying on software information barriers, we use the physical analogue of one-time-pad encryption to protect information. The process is based on a special single-pixel tomographic transform and the use of a physical secret key for each single-pixel measurement. The physical secret key is simply a thin foil, the composition of which is known only to the weapon owner. The x-rays leaving the weapon are convolved with the foil-key. The result is the equivalent to an encrypted bit representing the line-integrated density of one isotope in the warhead. By taking multiple projections the equivalent of a digital hash is built up. By comparing the hash values for a real and test warhead, one can confirm if the test warhead is a match or not. Finally, the inspectors may attempt to reveal valuable information about the warhead by doing a differential analysis of the various NRF resonances. This however can be easily prevented by adding an encrypting disk upstream from the weapon. In this manner only combined quantities can be inferred, and the inspectors may at most determine general - and useless - upper bounds on weapon parameters. A zero-knowledge detector arrangement for measuring warhead isotopes. The electron beam (blue) is converted to broad-spectrum x-rays (purple) and collimated by lead blocks (gray). The collimated x-rays pass through the nuclear warhead (center) and encode a set of narrow NRF absorption lines in the transmitted beam that contain information about the warhead's composition. This beam then interacts with the zero-knowledge foil (green). The foil fluoresces with a convolution of the foil's secret composition and the warhead's composition to create a unique 'glow' that is in essence an encrypted signature of the warhead's composition that cannot be decoded without knowledge of the foil's composition. This glow is measured using high-purity germanium (HPGE) detectors embedded in lead shielding. The NRF measurement starts with an electron accelerator. LNSP currently uses a 2.6 MeV Van de Graaff at 65 μA. The electron beam impinges on a tantalum foil target to create bremsstrahlung, continuous-energy x-rays. The beam that is transmitted through the weapon consists of a hardened continuum spectrum with numerous, very narrow notches. Those notches encode all the information needed to verify the warhead, but they are never directly observed, nor could they be because no real-world detector is able to resolve 1 eV notches against the continuum background. However, when the transmitted beam impinges on a foil composed of isotopes of interest, the rate at which the isotopes in the foil fluoresce is inversely proportional to the depth of each isotope's corresponding notches in the transmitted beam and proportional to the amount of that isotope in the foil, which is unknown to the inspector. The foil's fluorescence in 4π steradians is measured using four high-purity germanium detectors. Peaks in spectra corresponding to the isotopes of interest automatically authenticate the foil as being composed of the appropriate isotopes. The height of each peak constitutes the signature of the weapon-foil convolution. The spectrum for the authentic warhead can be statistically checked against the spectrum for the test warhead to determine if there is a discrepancy or if the test object is a match. While the basic concept was successfully proven using Geant4 Monte Carlo simulations (see here), an experimental validation was necessary to account for a variety of processes and engineering limitations. While the concept may work well on paper, there are many real world technical considerations to keep in mind. This include: backgrounds in the detectors, which muddy the precious but weak signal; instabilities in the incident, interrogating beam, which may make an honest candidate appear different from the template; a variety of secondary effects which may render the signal not specific enough. To achieve this PoC, we used the electron beam at the High Voltage Facility described above to produce a bremsstrahlung, 2.6 MeV photon beam. A proxy target was built, consisting of uranium plates, aluminium, and slabs of plastic to mimic the explosives found in nuclear weapons. The encrypting foil consisted of layers of uranium and aluminium. A picture of the setup, along with Jayson can be seen below. Jayson in his natural habitat. The schematic of the run, showing the positions of the photon beam, the proxy warhead, the encryption foil, and the detectors. ALL CLEAR: template to "honest candidate" comparisons, showing a match. In the experimental run described above we first spent days characterizing the beam and its (significant) instabilities. Once we identified all the sources of instabilities and isolated them, we could proceed with the actual experiment. We first placed a "template" proxy weapon geometry, described above, into the beam, and acquired spectral data with the high resolution germanium detectors for a "template" proxy weapon geometry. The same measurement was performed the next day, corresponding to an "honest candidate" proxy. The spectral comparisons are shown to the right. The two spectra are statistically identical. Thus, we cleared the "honest candidate." ALARM: the signals from the template (black) and the candidate (red) do not mach! Finally we switched to the "hoax." The uranium content of the weapon was replaced by equivalent amount of lead - a simple radiograph would never know! However NRF is isotope specific, so the cheat could be easily intercepted by our measurement. To the right is the equivalent comparison to the previous one, this time template vs. hoax. We observe a clear, 10 sigma discrepancy. The absence of uranium in the "weapon" results in less filtering in the energy bins that correspond to NRF, thus the foil emits more NRF photons than expected - this results in an enhancement of the NRF signal. Meanwhile do note that the Al-27 line at 2.212 MeV didn't change - that's because the hoax had the same exact amount of aluminum. Thus this is a multi-isotope test. A variety of other scenarios were tested. The full description of our work can be found in the new PNAS paper here. R. Scott Kemp, Areg Danagoulian, Ruaridh Macdonald, and Jayson Vavrek, "Physical Cryptographic Verification of Nuclear Warheads," Proceedings of the National Academy of Sciences USA, 113 (2016). The NRF Zero Knowledge Project is supported by the U.S. Department of Energy's National Nuclear Security Administration through a $25M five-year Consortium for Verification Technology. Additional support comes from the Carnegie Corporation of New York as well as Stanton Foundation.